Welcome to the circuits tutorial. This 5-minute tutorial will guide you through the basic concepts of circuits. The goal is to introduce new concepts incrementally with walk-through examples that you can try out! By the time you’ve finished, you should have a good basic understanding of circuits, how it feels and where to go from there. First up, let’s show how you can use the Component and run it in a very simple application. Okay so that’s pretty boring as it doesn’t do very much! But that’s okay... Read on! Let’s try to create our own custom Component called MyComponent. This is done using normal Python subclassing. Okay, so this still isn’t very useful! But at least we can create custom components with the behavior we want. Component(s) in circuits are what sets circuits apart from other Asynchronous or Concurrent Application Frameworks. Components(s) are used as building blocks from simple behaviors to complex ones (composition of simpler components to form more complex ones). Let’s now extend our little example to say “Hello World!” when it’s started. Here we’ve created a simple Event Handler that listens for the started Event. Methods defined in a custom subclassed Component are automatically turned into Event Handlers. The only exception to this are methods prefixed with an underscore (_). If you do not want this automatic behavior, inherit from BaseComponent instead which means you will have to use the ~circuits.core.handlers.handler decorator to define your Event Handlers. Alright! We have something slightly more useful! Whoohoo it says hello! Press ^C (CTRL + C) to exit. So now that we’ve learned how to use a Component, create a custom Component and create simple Event Handlers, let’s try something a bit more complex by creating a complex component made up of two simpler ones. We call this Component Composition which is the very essence of the circuits Application Framework. Notice the way we register the two components Bob and Fred together ? Don’t worry if this doesn’t make sense right now. Think of it as putting two components together and plugging them into a circuit board. Cool! We have two components that each do something and print a simple message on the screen! Now, what if we wanted to create a Complex Component? Let’s say we wanted to create a new Component made up of two other smaller components? We can do this by simply registering components to a Complex Component during initialization. 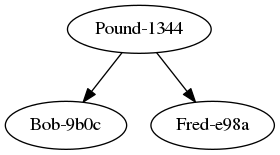 This is also called Component Composition and avoids the classical Diamond problem of Multiple Inheritance. In circuits we do not use Multiple Inheritance to create Complex Components made up of two or more base classes of components, we instead compose them together via registration. The extra lines in the above output are an ASCII representation of the above graph (produced by pydot + graphviz). Since circuits is a framework written for the Python Programming Language it naturally inherits properties of Object Orientated Programming (OOP) – such as inheritance. So let’s take our Bob and Fred components and create a Base Component called Dog and modify our two dogs (Bob and Fred) to subclass this. What if we only want one of our dogs to bark? How do we do this without causing the other one to bark as well? Events can be fired with either the .fire(...) or .fireEvent(...) method. So far in our tutorial we have been defining an Event Handler for a builtin Event called started. What if we wanted to define our own Event Handlers and our own Events? You’ve already seen how easy it is to create a new Event Handler by simply defining a normal Python method on a Component. Defining your own Events helps with documentation and testing and makes things a little easier. So here’s our example where we’ll define a new Event called Bark and make our Dog fire a Bark event when our application starts up. Asynchronous programming has many advantages but can be a little harder to write and follow. A silently caught exception in an Event Handler, or an Event that never gets fired, or any number of other weird things can cause your application to fail and leave you scratching your head. Fortunately circuits comes with a Debugger Component to help you keep track of what’s going on in your application, and allows you to tell what your application is doing. Now clearly there is no such variable as name in the local scope. That’s right! You get nothing! Why? Well in circuits any error or exception that occurs in a running application is automatically caught and dealt with in a way that lets your application “keep on going”. Crashing is unwanted behavior in a system so we expect to be able to recover from horrible situations. SO what do we do? Well that’s easy. circuits comes with a Debugger that lets you log all events as well as all errors so you can quickly and easily discover which Event is causing a problem and which Event Handler to look at. You’ll notice whereas there was no output before there is now a pretty detailed output with the Debugger added to the application. Looking through the output, we find that the application does indeed start correctly, but when we fire our Bark Event it coughs up two exceptions, one for each of our dogs (Bob and Fred). From the error we can tell where the error is and roughly where to look in the code. You’ll notice many other events that are displayed in the above output. These are all default events that circuits has builtin which your application can respond to. Each builtin Event has a special meaning with relation to the state of the application at that point. See: circuits.core.events for detailed documentation regarding these events.